E3 Triple features wide illumination pattern providing outstanding visibility in every surrounding. AL-6061 case, 130g. Best used with Supernova tail lights. Includes Multi-mount which is a versatile dual-pivot, height-adjustable arm that mounts to hole in fork crown. Wiring included, powered by standard dynamos (dynamo not included). Internal capacitor provides up to 7-minute run time while sitting still. 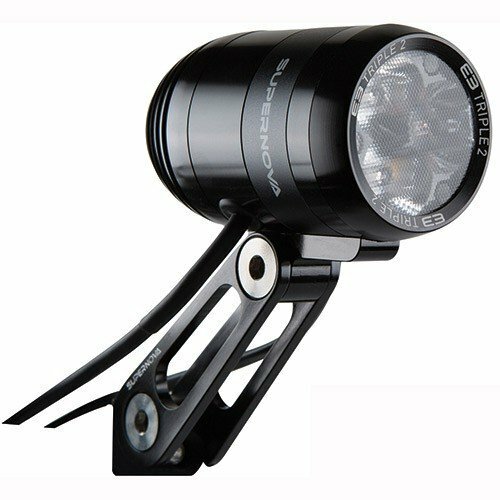 Ideal for 24-hour MTB racing, randonneuring, cyclocross training, and general off-road night riding. keyword search: dyno. Battery: Dynamo / Generator Rechargeable. If you have any questions about this product by Supernova, contact us by completing and submitting the form below. If you are looking for a specif part number, please include it with your message.